Leo Salazar (San Bernardino, California, US) is a certified business coach and trainer who works with individuals and groups to align their performance with the requirements of their teams and organizations. His desire to fully understand international corporations led him to gain an MBA in International Business Development from the University of Twente’s TSM Business School (the Netherlands, 1995), as well as a master’s degree from the Greenleaf Center for Servant Leadership (US, 2008), and coaching and leadership courses from the European Institute (Netherlands, 2014), Coaches Training Institute (CapGemini Academy, France, 2010), and Harthill Associates (UK, 2009). Leo's undergraduate work (Bachelor of Science, 1983) is from Old Dominion University (Virginia, US). 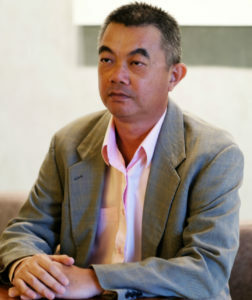 Dr. Teh Peng Hong, BSc, MBA (University of Strathclyde), DBA (University of Newcastle), is a Malaysian of Chinese descent. He is a value marketer with more than 23 years of experience in international business environments dealing with multinational companies as well as small- and medium enterprises. He has extensive international business and general management qualifications. He is responsible for starting up as well as establishing business structures through good motivational management style and coaching skills. Strong conceptual and practical understanding of world cultures. Direct international experience of working with large enterprises, intermediary organisations, non-governmental organisations, academic institutions and government bodies. Ability to adapt, integrate and work within diverse cultures and environments. Complex project planning capabilities and strong interpersonal skills. Vin Morar (Manchester, UK) is a British national. He is a specialist in Enterprise and Management Development programs. He has 27 years of experience, having worked in many (35+) countries in Asia, Africa, Middle East and Europe. Vin's expertise and fields of intervention are in entrepreneurial skills training design & delivery. Clients include multinational corporations as well as institutions such as EU (Phare); DfID (UK); Senter & Nuffic (Netherlands); UNIDO (UN) and major universities. Vin has both a strong conceptual understanding of world cultures as well as practical experience. He has direct international experience of working with large enterprises, intermediary organizations, NGOs, academic institutions and government agencies. Saarah Choudhury (Sheffield, UK) is a graduate of University College London (UCL), one of the world’s elite research universities. Her primary business experience is within the field of retail management at Covent Garden, one of the most international sales locations in the world. While she is a born and bred Brit, she travels extensively for work as well as for leisure, and has both visited and lived in countries within the Middle East, Asia, Europe, and the Americas. Saarah’s role is integral to the effective management and operation of BRIL.Solutions. Her personal multilingual and multicultural background and expertise provide the company with clear insight into the realities of progressive interaction within international environments.